Red fountain pen inks are tough for me. Red gel, red ballpoint, red roller ball inks - no problem. But red fountain pen inks can't seem to crack the rotation. Why is that? I think the obvious answer is maintenance. I try to keep as few fountain pens inked as possible, ranging from five to a somewhat overwhelming ten. My preference lies with blues, predominantly blue black, with possibly one turquoise, one black, and one orange ink filled somewhere within the group. Anytime I have inked up red I end up not using it (maybe orange is my red? ), and down the sink it goes. Friends and readers of this blog seem to love red inks though, at least judging by the amount of questions I get about them. Luckily my friend Thomas sent a couple of samples my way, like this Diamine Red Dragon, so I am able to test without comittment. That is always a bonus in my book. In my admittedly limited experience I categorize red inks two ways: bright or dark. Bright includes pure reds that really pop off the page, or reds that show strong hints of pink and/or orange. Dark includes inks that are on the blood or brick end of the spectrum, possibly with some brown showing through. Red Dragon is an ink you should consider if you are looking for a dark, blood red. Like most Diamine inks - which are becoming some of my favorites - it is well behaved from my TWSBI 1.5 mm stub nib. The feedback is smooth and consistent with minimal shading, and an average to below average dry time. I'm impressed by it, but it isn't the red ink that is going to make me reconsider adding one to my rotation. What other red inks should be on my radar? 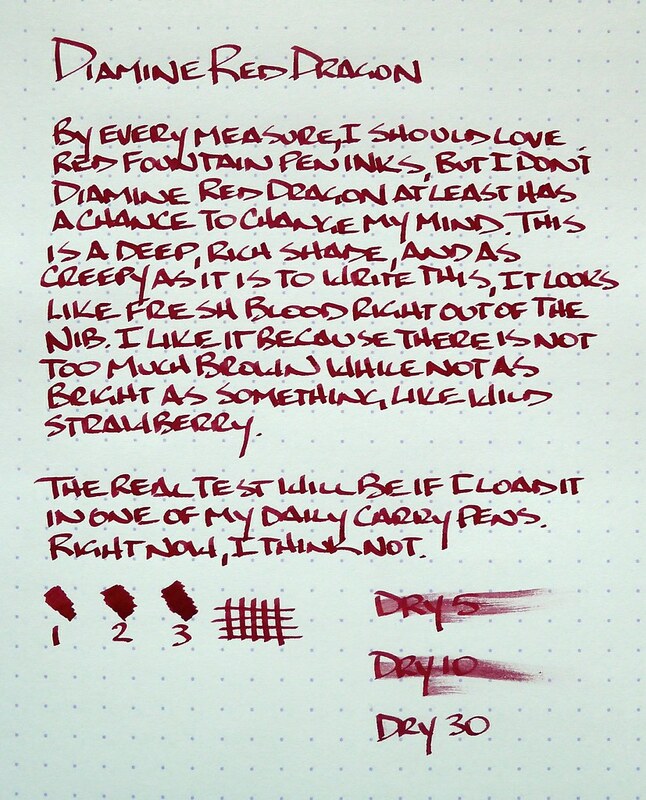 Posted on July 19, 2013 by Brad Dowdy and filed under Diamine, Ink Reviews.